There are other books that might be easier to follow and cover the basics of the language without getting into the details of the language specification and advanced topics. A better option is to use a debugging tool or a development tool that integrate with the web browser that I can interact with directly without the need to use external HTML file. This provide a great learning environment for me as I don’t need to leave the web browser to try out the book examples and experiment with the language, both the interpreter and development tools are integrated nicely with the browser and they all self contained. For production code, a more robust specialized integrated development environment (IDE) must be used as the development tools that come with the browsers are not meant for developing production solutions. It supports ECMAScript 5.1 language standard. it also supports HTML5 and CSS3. Web Console is the most basic tool which allow interacting with the browser through simple commands. 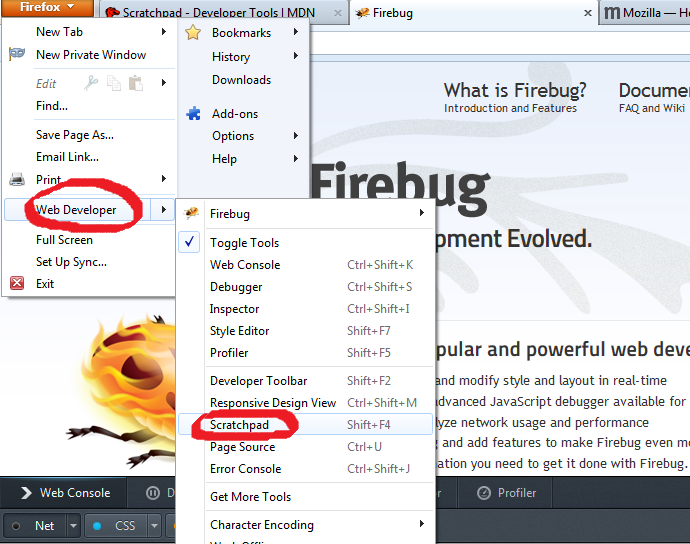 Finally there is a cool open source add-on called Firebug that is well known among web developers community, it has comparable features as Mozilla Scratchpad and web console debugging tools. 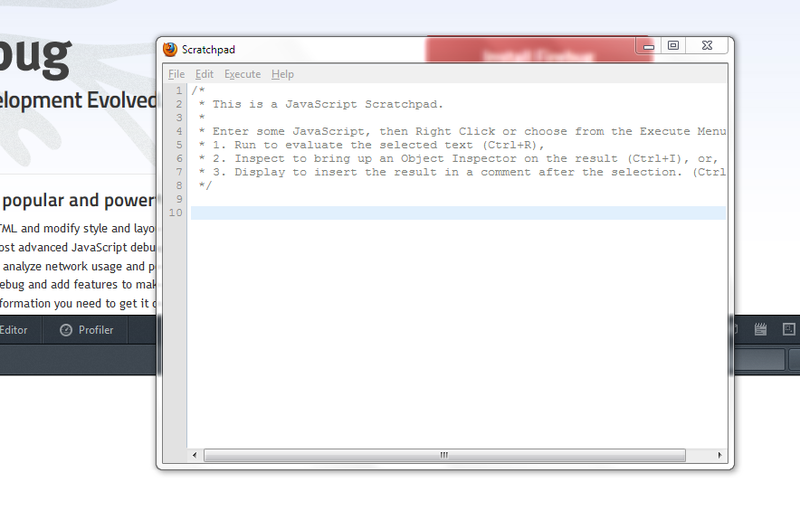 Then using the main menu, choose Web Developer – > Scratchpad (or use the shortcut Shift+F4). 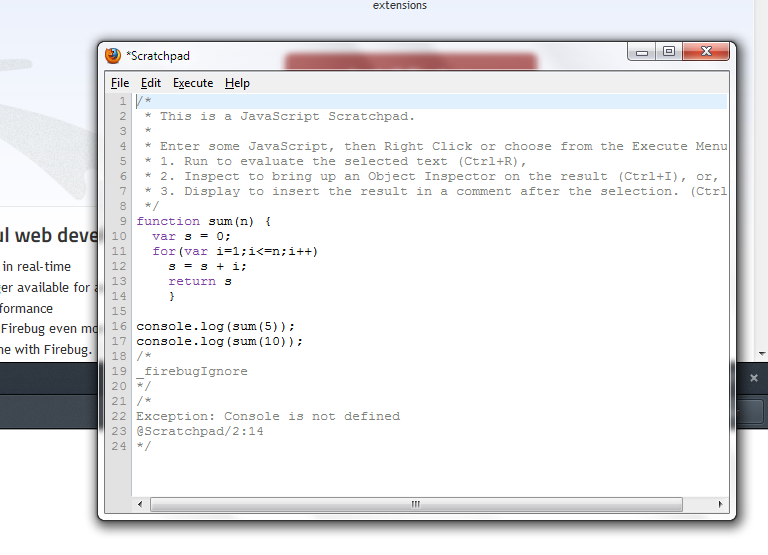 Paste below code into the Scratchpad window. It is a simple function to calculate the summation of a series of the integer numbers less and equal to the input number, then I used console.log function to call the function and send the output to the web console output window. console.log is a handy function to debug and log code results. In order to run the code, either use the Execute menu then click Run or use ” CTRL + R” shortcut. The result will be shown in the Web Console Logging window (because I used console.log function). Note (if Firebug add-on is installed and enabled , the output will be shown in the Firebug output window). 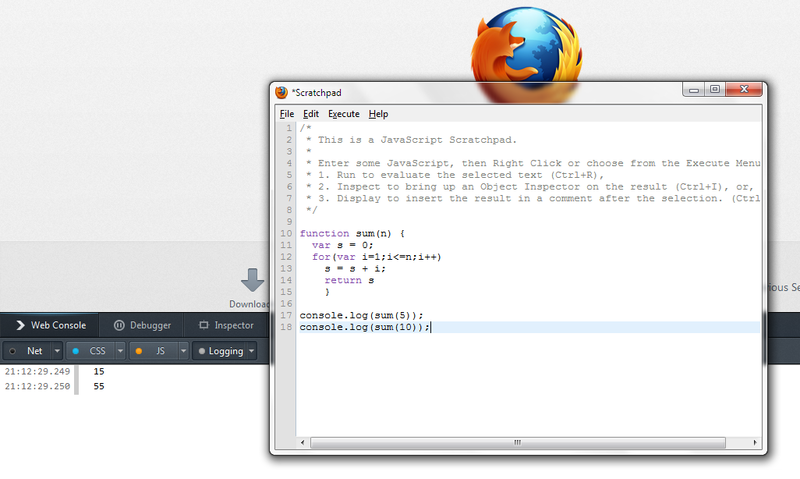 Make sure the Web Console window is opened in order to see the console.log output after the program is run. To open the window use “Ctrl+ Shift + k” shortcut. After the program is run, the output will be shown in the Web Console window. As shown in the output window the two console.log function calls with the corresponding function sum output.